← The 50 Foot Woman Tangles with Someone Her Own Size–the Triceratops! Who’s Winning the Rumble in the Stacks? 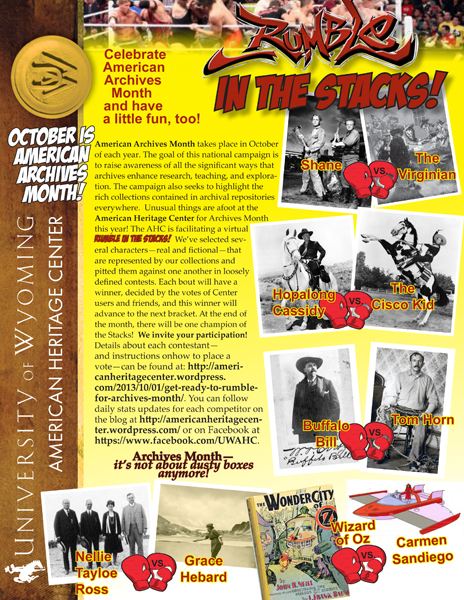 We’re having a lot of fun with Archives Month this year, and we hope that you are, too. All of the competitors have now been announced, so some tough choices lie ahead! There’s only a few days left to vote for your favorite contender from each bout, so make sure that you weigh in to determine who will continue on to the next level of the Rumble. Tell us what you think! Leave a comment on our blog, give us your vote on Facebook (https://www.facebook.com/UWAHC), email ahc@uwyo.edu or send a carrier pigeon! The deadline for each of these 8 matches is October 14th at high noon!